Today I'm writing because I have 3 things for you. A video for kids, age 8 and up. An invitation to a membership site, where the emphasis will be connection and activism. And finally, I was touched by the response of so many of you. Last time I had a request - that you would take a few minutes to answer a survey. Within a few minutes the first response came in. Then more and more. To everyone who took the time to answer, thank you. I've posted the results. 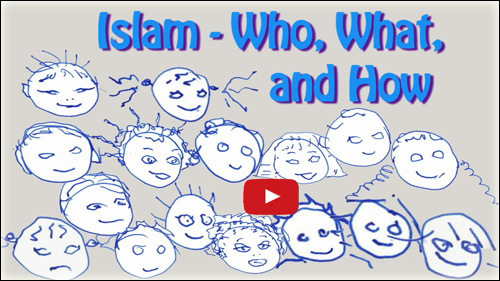 I'll start with the kids' video: Islam - Who, What, How. More and more, kids are learning about Islam in school. I thought: if you can't beat them, join them. Instead of arguing with the content that kids are being taught, I'm suggesting that this short video needs to be shown in any school that mentions Islam. In just 9 minutes of fun, kids learn about the 3 core parts of Islam, including al Walaa wal Baraa; about what the outcome is supposed to be; and about a lot of the rules of Islam. Not bad, for 9 minutes. The video isn't only for kids. It's a great tool for teachers and parents - for all people who want something quick, easy, simple and fun that gets Islam across. Why watch the video? I want us to act together so every school in the West is sent this video, so that parents and children across the West watch this video outside the schools if the schools don't show it. They say forewarned is forearmed. Almost none of us were forewarned. This short easy video "arms" people, kids and adults alike, about Islam. By the way, the content of the video has been verified by Bill Warner. I sent it to him, to make sure I had Islamic ideology completely right. Yes, I did. He just said I needed to add one thing - abrogation and how this applies to Christians and Jews. So I put that in. Yes, this is an easy kids' video that deals with al Walaa wal Baraa, the Islamic Caliphate, and abrogation! Next week, there will be more: scholarly sources backing everything said in the video. Why have a membership site? It's much easier if we have support. Just think of Christianity. People, by and large, didn't come to the Christians. Christians went out to spread the message, generally not alone. My thought: many of us need both more physical connections, and if we can't have those, then more online connections. We can also often use more ideas on what to do, more encouragement, more sharing of experiences. Plus no matter how much we already know, often we've been missing something that makes a big difference. I've just heard from someone who has found that her whole way of dealing with people who don't want to hear anything negative about Islam has changed lately. She used to get bogged down with the horrors of Islam, a myriad of quotes from the Quran and various Hadiths. Not any more. She just calmly tells people about al Walaa wal Baraa. By the way, if you become a member of Live Freedom, you get 2 gifts. Bill Warner's excellent Factual Persuasion. And Kenneth Roberts' Islam - 1,2,3: everything you need to know about Islam in just 9 short pages. There's something else we need: ever so much more success. I've just gotten an email from a British friend. It's abysmal, the pro-Islamic bias. She was venting. I'm trying to invent something that kept happening in my favorite childhood books: the hero or heroine managed to come up with something, so there was success, against all the odds. Right now, I've come up with the kids' video and the membership site. Finally, the results of the survey. An unsurprising result: no one who took the survey identified as Islamic. A somewhat surprising result: out of 164 people, not one person under 25 took the survey. Again I come to the kids' video: we need to reach the young. 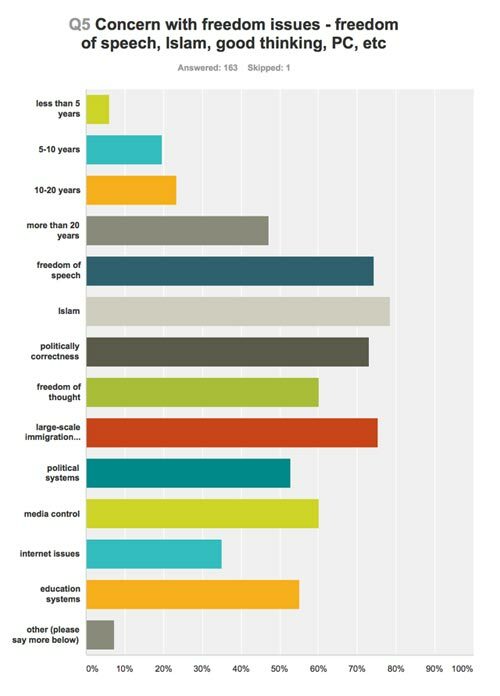 One fantastic result: many of you are intensely concerned about many freedom issues, and are also active, often searching for more ways to have an impact. More on the survey. Hungers include a desire for more connection, more community and more opportunities for activists. More reason for a group. For those who join Live Freedom, by the way, the first online group meeting will be on July 26. The topic: taking back the schools. Here's one result, on the level of concern with freedom issues. For all the others, you can download the full results. The download link is right below. To download with a PC, right-click and select "Save As". To download with a Mac, control-click and select "Download" or "Save Link As". PS. Next time, a kitten photo-update. One thing: his name won't stay Squeak. He's stopped squeaking. He bounces like a tiny bunny. All the world's a playground - feet, phone cords, plants. Yesterday, I thought of calling him Oliver, for Oliver Twist. A hard start. And finally (in this case, at age 3 weeks) a good home. Just one point about narcissism since it parallels victimhood. Muslim communities function on it since it imbues most of them with anxiety and fear. This is what substantially accounts for the tendency of most Muslims to close ranks at any manufactured sign of threat. It is but a few steps from rationalising terrorism as the understandable result of deeply rooted prejudice against Muslims (i.e. Islamophobia) and existential threats to very survival. Once combined with the triumphalist Koranic assertion of Muslim superiority and destiny to rule over Dhimmis and Kuffars the toxicity of Islam is easy to explain. My response: the points make sense to me. 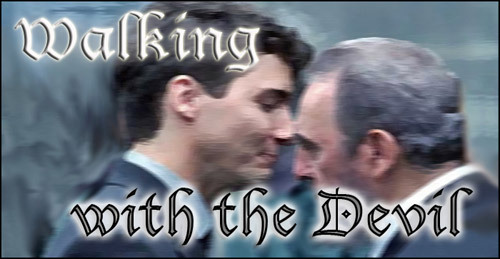 I've read about the Stockholm syndrome to explain the see-no-bad-Islam response of the West. But something was lacking for me: something that would adequately account for the power of Islamic psychology, its intense hold on most Islamics. Narcissism explains that. It's extremely difficult for narcissists to be reached. Plus it's very difficult for narcissists to acknowledge, let alone undo, their narcissism. Even more, narcissists, I read somewhere, have a lot of power in transmitting their view of things to others, to "hold captive' the view on reality of the other - which Islamics have certainly managed to do (along with help from infiltrators, etc).